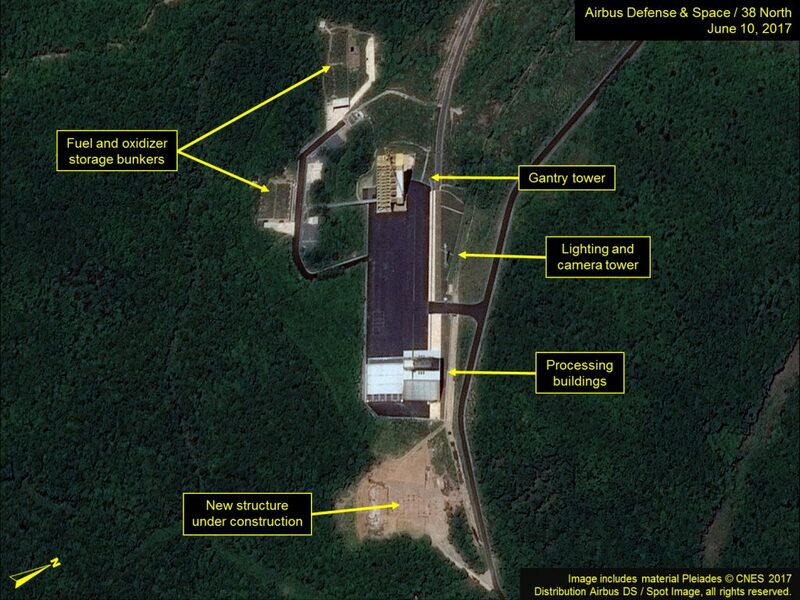 Commercial satellite imagery of the Sohae Satellite Launching Station from June 10 indicates continued construction throughout the facility, most notably at the southern end of the launch pad. The exact purpose of this activity is unclear. 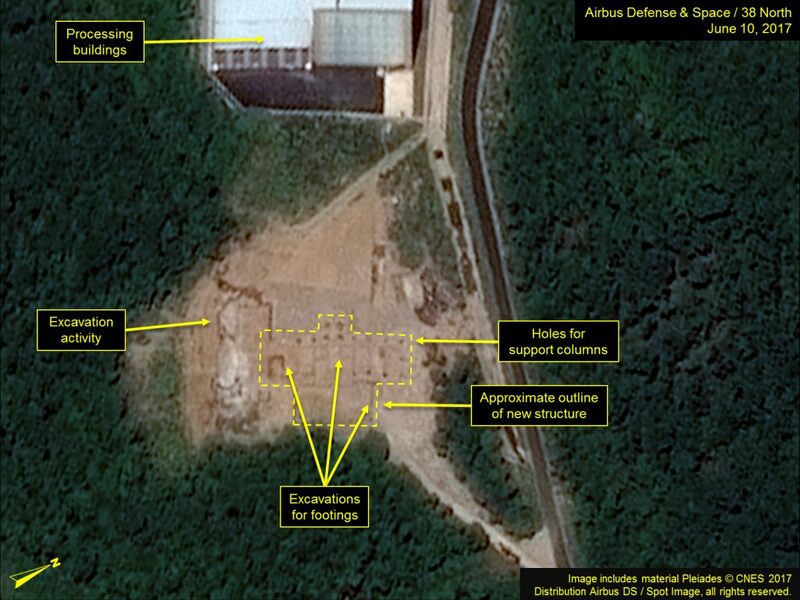 Ongoing construction indicates North Korea’s long-term commitment to further developing this facility and its space launch program. Approximately 50 meters southeast of the launch pad, an open area (approximately 5,000 sq. meters) was excavated throughout 2014-2015. This activity ceased in mid-2015 and unexpectedly resumed in March 2017, continuing intermittently since then. The latest imagery shows excavations for a building’s footings and support columns, suggesting a structure of approximately 920 sq. meters. It is too early to determine if the suspended excavation activity in 2015 was related to this new structure’s originally intended construction, or if this is an entirely new development. While the planned purpose of the new structure is unknown, its proximity to the launch pad suggests it is related to launch operations support. Figure 1. Construction underway just south of the launch pad. Figure 2. Close-up of construction activity. 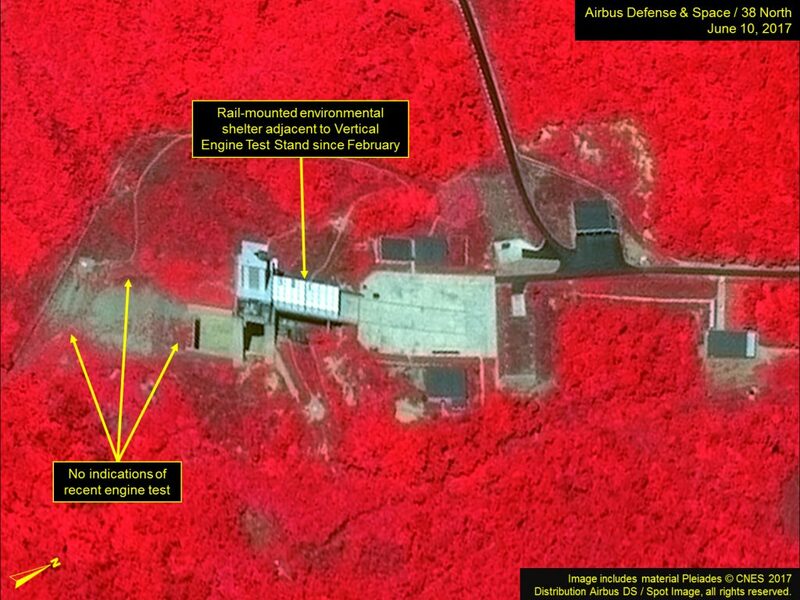 Both natural-color and infrared imagery of the vertical engine test stand indicate that no unreported rocket engine tests have been conducted in the past month. 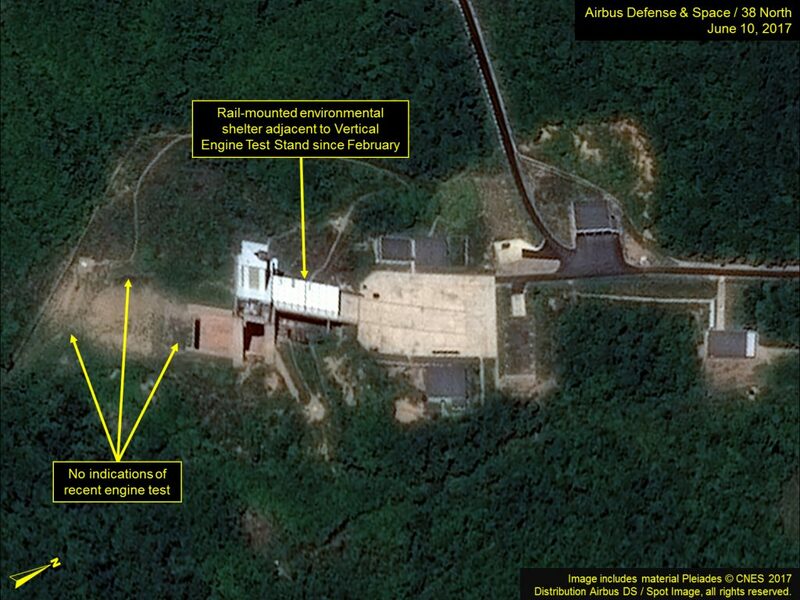 As was the case in imagery from April 22 and May 15, the vertical engine test stand, launch pad and gantry tower all appear in a good state of repair and no vehicles or personnel are observed in any of these areas. Although no preparations for either a new engine test or satellite launch are apparent in the June 10 image, either of these could occur with little or no advance warning. Figure 3. No indications of engine tests in the past month based on natural color and infrared images. No new activity is noted at the circular position 750 meters to the southwest of the launch pad or the roads and utility right-of-ways leading to it. Except for what appear to be two small vehicles at the Horizontal Processing Building and some minor activity at the warehouse and support area, no significant activity is observed elsewhere at the Sohae facility.